Amidst the joyful cacophony of parents and children walking the hallowed halls of the building, the Millcreek-West Unity Board of Education convened in regular session at Hilltop. Grilling out on the front lawn, Hilltop hosted its open house on August 18, an earmark of the academic season which began two days later. Relocating to the school’s library on the second floor, the Millcreek-West Unity Board of Education met for its August Meeting without distraction. The recurring theme of the evening was preparation of the building and staff for the school year. “At this stage of the game, we’re just moving forward.” Superintendent Larry Long explained to the board. They’d actually been moving forward since August 4, when teachers began to come in and prepare for the arrival of their students. Persistently, the educators continued to come in on a daily basis. Al Wheeler, the school’s Maintenance Transportation Manager, updated the board on renovations to the building that took place over the Summer. Not before humbly passing off the credit in favor of his staff, though. And that was no easy task, either. The parking lot was painted and cracks were filled, as the harsh Winter had created more fissures on the asphalt than usual. This issue had become so severe, that not all cracks were able to be filled, leaving more work to be done next Summer. Inside the building, new lighting was installed in the gymnasium, replacing 58 lights. Those lights will eventually be sold, according to Wheeler. A new garage door was put up as well, donated to the Ag Shop by A.J. Door LLC. Plastic strips were used in an attempt to correct problems with the old door, but they were ineffective. Elementary Principal Laura Springer also addressed the board for her regular report. Hilltop’s enrollment from Preschool to sixth grade is 310 for the current school year. Students in the third grade or younger will be taking the DIBELS and STAR tests in mid-September. These tests will evaluate their reading levels, allowing the school to place struggling children on a reading improvement plan, or R.I.M.P., for short. A R.I.M.P. is tailored to the needs of individual students. Unable to attend the meeting, Principal Steven Ridley’s report was reviewed in written form. Of note, Ridley plans to have all seventh grade students take a Math Applications course, which will work alongside the school’s seventh grade Integrated Math course. The new course will be alternated daily with a Digital Communications class every other day. It’s Ridley’s hope that this plan will lead to more eighth graders registering for Algebra I. A contract between the village of West Unity and the board, which renewed the School Resource Officer, was finalized at the meeting as well. $17,000 from the General Fund will be temporarily used to fund the position. Proceeds from a recently approved safety level will replace the funds once available. 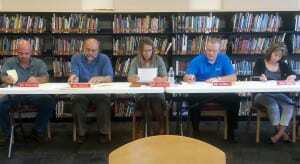 Another contract, this one involving the board and the Millcreek-West Unity Education Association, was also approved. This agreement with the teacher’s union will last three years, taking effect on July 1, 2014 and lasting until June 30, 2017. In year three of the deal, negotiations on salaries may be reopened. A second reading of the updated NEOLA policies, which govern the way in which school boards operate, was completed by the board. The changes to the policy are negligible, however. The board approved an agreement with the Wood County Juvenile Detention Center for the coming school year. If its services are needed, the institution will be paid $64 per child for the first two days, and $45 per child for the third. Payment to Northwest State Community College was agreed upon by the board, in the amount of $14, 995.50. This cost is to cover the 2013-14 PESO tuition. The school had previously received $17,264 from Northwest State in order to offset the cost. Ken Brown and Tony Gerig were appointed Co-Assistant Athletic Directors by the board. Shannon Swartz was approved as a substitute teacher, while Desiree Arps was approved as an Assistant Track Coach. Nancy Miller was hired into the school as well, taking on the duties of Musical Choir Pianist and Assistant Musical Director. A Donation from Parkview Physicians Group for $890 was also accepted by the board. With no other issues pertinent to the board, Carothers adjourned the meeting. They will next meet in regular session on Monday, September 15 at 6:00 P.M. in the Band Room. At 5:45 P.M., just prior to the meeting, both the board and the community will have the opportunity to meet Hilltop’s new staff. Be the first to comment on "Hilltop Board Has Everything Ready For 2014-2015 School Year"